Dremel 4000 vs 4200 which rotary tool is best? Both models at first glance seem almost identical. However, on closer inspection there are a few subtle differences. The Demel 4000 rotary tool is powered by a 1.6 Amp motor and has a variable speed range of between 5,000 and 35,000 RPM. You can also see how the 4000 stacks up against the older 3000 model here Dremel 3000 vs 4000 and the newer flagship model of the range here Dremel 4000 vs 4300. ​The Dremel 4200 is a 1.6 Amp variable speed rotary tool. It has a speed range of between 5,000 and 35,000 RPM. The 4200 has a separate speed and on/off controls, meaning you can start and stop it at your desired speed. Although they have practically the same motor and performance the major design difference between the 4000 and the 4200 is the improved ventilation and cooling of the newer 4200 model. Like most Dremel's in the 4000 line of rotary tools the 4200 comes in a tough plastic carry case with a handle and all of the accessories along with the rotary tool fig neatly and securely inside. Ergonomically the 4200 is just as usable for a left handed person as a right handed. And it can be gripped in several different ways depending on how and what you are working on. There are three different kits to choose from all of which has a varying number of attachments and accessories. The ​4200-4/36 has 4 attachments and 36 accesories, the 4200-6/40 comes with 6 attachments and 40 accessories and the largest kit in the series the 4200-8/64 comes with 8 attachments and 64 accessories. ​So what are the differences between the Dremel 4000 and 4200? The 4000 is a more versatile tool as it can accept more than just the 1/8th inch shank that the 4200 is limited to. The 4000 can a collet shank from between 1/32 - 1/8 of an inch. The 4200 has a slightly better cooling thanks to an ​improvement in the venting design that Dremel claim reduces running heat by up to 20%. The Dremel 4200 does not require the use of a tool to change the bit however you can also purchase a tool-less chuck for the 4000 separately. 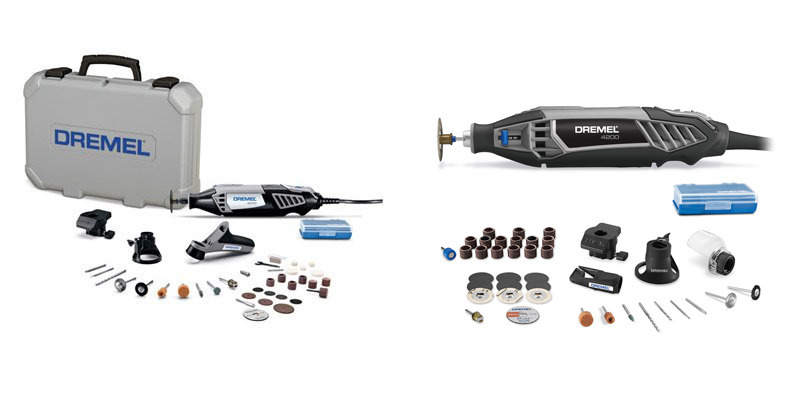 ​Dremel 4000 vs 4200 performance wise both machines are on a par and are both highly capable rotary tools. For us the 4200 is the winner as the built in EZ chuck makes changing bits a breeze.